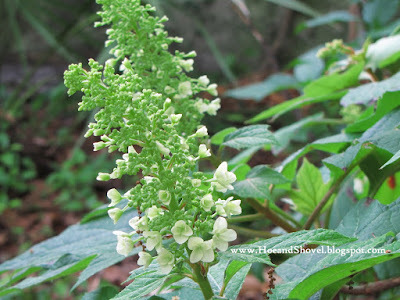 Have you ever wanted a plant to bloom so badly you imagine you see blooms emerging. I have. Upon closer inspection it feels pretty silly when reality reveals the pretty tip growth is actually not the blooms you so desire would come forth. Instead newly unfurling leaves have fooled the wishful thinking... again. Last spring, after allowing a whole year for the Hydrangea quercifolia, Oakleaf hydrangea to get settled in since they were purchased, still NO blooms on the ends of any branches. No matter. The large oakleaf-shaped foliage comes quickly alive in spring and turns to reddish brown-copper in autumn. It was decided that if by chance they never bloomed in this environment they were worth keeping just for the foliage interest and the cinnamon-hued stems. Ah, your eyes do not fool you and you are not imagining that beautiful plant above does have ONE LONE BLOOM. This spring all three of the hydrangea shrubs decided to push out some pretty white flowers. One lone bloom a plenty of pretty foliage on the hydrangea in the front gardens. But for the past several weeks the plant sited in the way back gardens has several large, cone-shaped blooms on the end of almost every branch. This is exciting stuff around here. 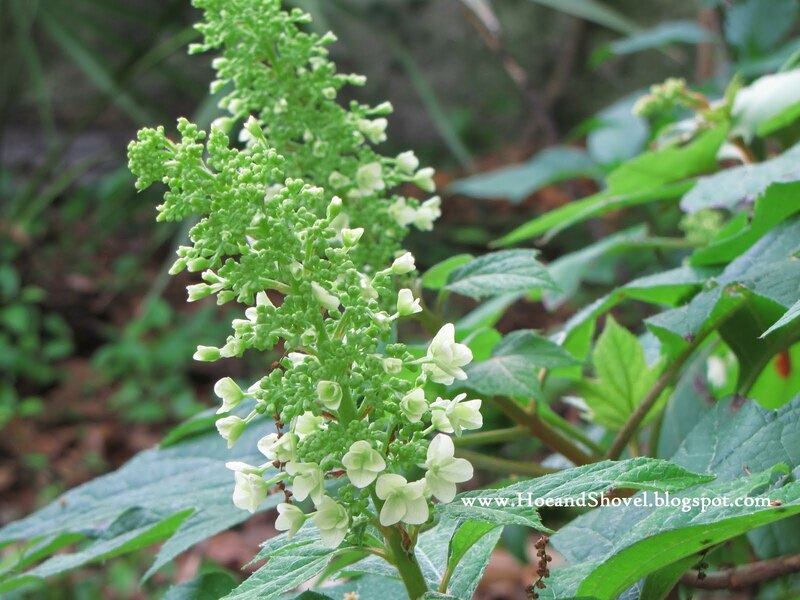 Oakleaf hydrangea is native to Florida which is one of the main reasons I decided to give it a try. I have a feeling they like it a bit further north than my zone 9-ish gardens. Which means the unusually cold winter we had this year probably helped bring about these blooms for spring. Almost always when new plants that aren't readily found in my area are purchased I plant more than one. Experimenting with location helps me to know what the plant likes best. So I try to site them in different places and note how they each respond. The one that bloomed best might get a tad more sun and a little less water than the other two. All are nestled up under towering oak trees. 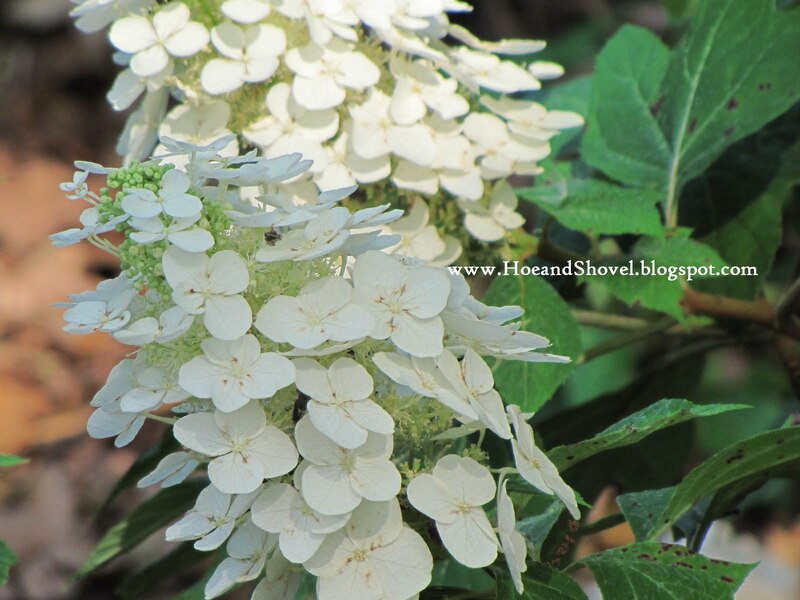 Oakleaf hydrangeas are easy maintenance requiring little attention in the way of irrigation or pruning or fertilizing. We'll wait to see how they each do next year to come up with some final results with regards to their desire to bloom where their planted. In the meantime, being a big fan of white and a big fan of hydrangea of any sort I'm just going to enjoy whatever it is they are willing to give. I love hydrangeas but it is too hot here even though some people have managed to grow them successfully on the island. My great grandfather grew them at his home in Grenada located up on a hill where it was cooler. My mum Miss Rose who was raised by her grandparents, also tells me that he grew blueberries there as well. I am still dreaming that I will buy a house somewhere I can grow these things. Have a great weekend my friend! Hugs to you! I hope they just needed time to get going in your garden. Before I had oakleafs of my own, I saw a huge bouquet in someone's home that had been in a church the day before for Sunday service. I thought, "I could never cut such lovely blooms, and so many!" Now I could. 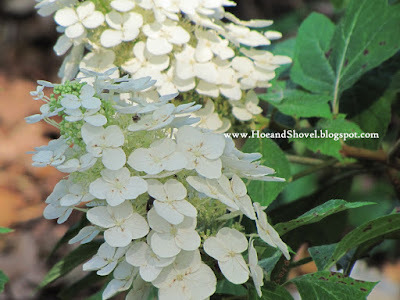 I definitely want to try an oakleaf hydrangea they are so pretty! I haven't seen any in the nurseries. I might need to search a little more. South Florida is wayyyyyyyyy to HOT for those beauties. We have a retirement house near Live Oak, Florida and I see Hydrangea's big and beautiful all the time. We are not retired yet but when we had the house built (nothing is as sad as a house with no plants and flowers)I just planted a few things. things that would have to make it alone with no help from me. A Natural survivor. I planted several Butterfly bushes, one under the Live Oak trees that has survived. I planted 1 HYDRANGEA that someone gave me in a pot, also in the shade but sad to say, the first winter it died back to the ground and they would come back but really REALLY small and finally died this year. My pentas and salvia all come back but not really thick and pretty but hey they are surviving. Next year I plan on puting in a micro drip and spray system on a timer so I can FINALLY get some pretty landscaping done. House is in zone 8b for AWESOME. Pretty hot in the summer 3 months then turns to awesome for 9 months. ANYONE have ideas for plants and flowers for North Central Florida? Interesting how the individual flowers look so similar to the flowers on crown of thorns. Lovely hydrangea! I had oak leaf at a previous home and it took years to bloom. PS. I am reading blogs from our iPad in France. A nice traveling computer! I'm not sure how well oakleaf hydrangeas will do there. Here in North Florida, they grow in sun or shade. The one I have in sun blooms before the one in partial shade and has more blooms. The blooms on the one in the shade last longer though and the leaves stay green longer so its a toss up which is the best site. If they are happy they will spread little babies around and form a colony or you can easily move them. That is a beautiful plant. I do hope it continues to bloom for you. 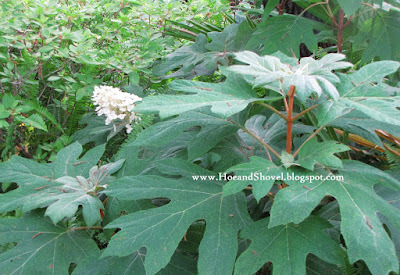 I've been considering an Oakleaf Hydrangea for a spot in my front yard. Those leaves are nice with or without blooms, I agree. This year, my oakleafs do not have as many flowers. Evidently, the cold killed several stems' tops, so no blooms. This is the first time this has ever happened, but then this past winter was crazy. Even without flowers, I agree with you that the foliage and stems are worth it. Hoping for more flowers next year. How wonderful that you could even get the native to grow. I have tried a couple of times in a couple of different places and had no luck. 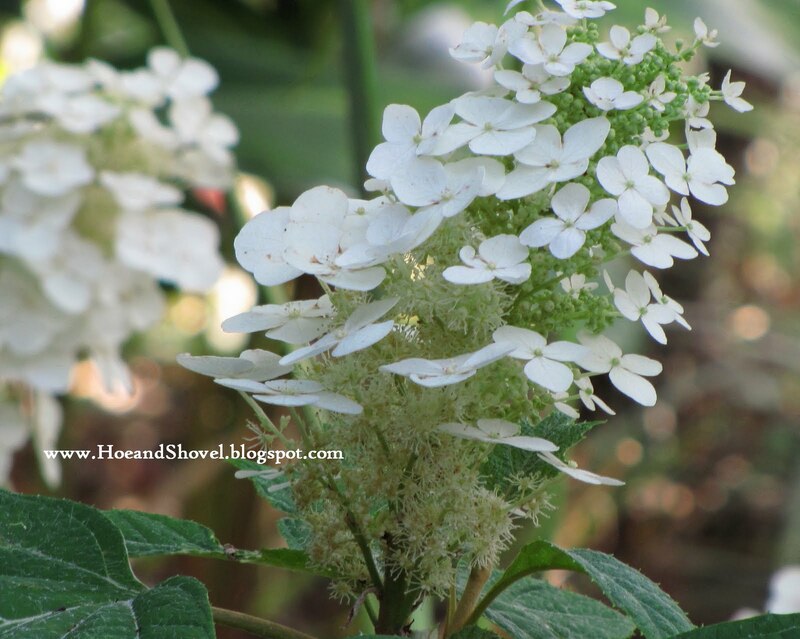 Oakleaf hydrangeas were favorites of mine when I lived in Zone 7. They are real beauties. In North Carolina last year, I saw a huge specimen off the road and begged my husband to pull over. It turned out to be in a lovely garden/park surrounding an old mansion that had been acquired by the city. I had my daughter pose in front of it. The hydrangea was easily over six feet tall and wide. Gorgeous! Anyway, I didn't think we could grow these in CenFla. I will definitely watch yours in progress, as I think you probably live near me as the crow flies (Tampa Bay area). I'm a hydrangea nut ... don't you just love them! Remember the Native Nursery you and your Mom went to some time back? I believe it was Dunnellon? Please forward the info to me ladyg8r2001@yahoo.com when you can. Thanks! I forgot to mention how the flowers turn to pink and then fade away slowly. Love it! All of my plants were leafless in March from the cold. They all came back VERY rapidly and then they bloomed. I will be looking to buy more of these to add to the one in the back. Joey, yes, I adore hydrangeas but all the other varieties are not very successful this far south. I have seen them occasionally growing down here but I have no idea what the secret is. Melody, Thanks for offering the help with what to plant. You are in a totally different zone than here. All of my plants were leafless in March from the cold. They all came back VERY rapidly and then they bloomed. I will be looking to buy more of these to add to the one in the back. Cameron, So jealous!!! But happy for you and congrats to your son. Cydney, That was in March of 2009. Hard to believe. Yes, it was Dunnellon ~~ I'll e-mail you. 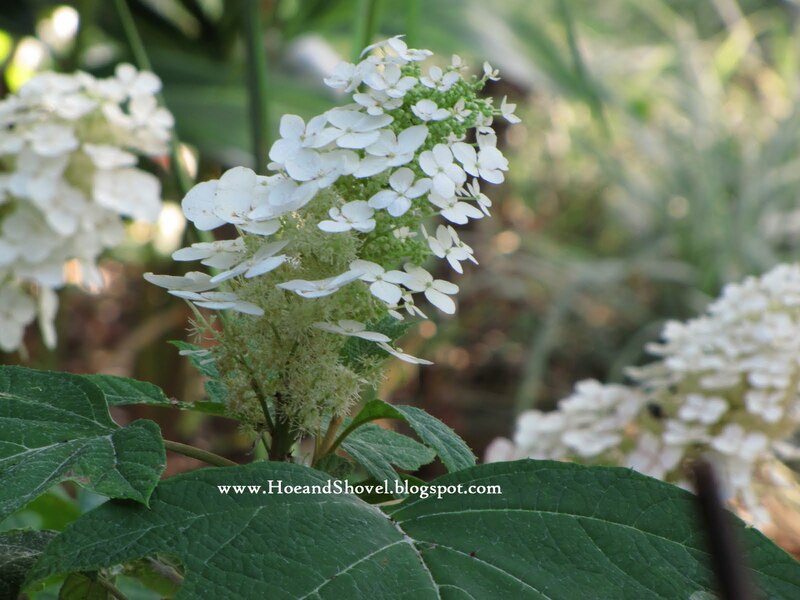 Where did you buy your oak-leaf hydrangeas? I have tried and failed in my St. Pete garden to grown them. Just too hot here. I also tried scented geraniums, which I absolutely love, but the summer heat just did them in :( Any suggestions? Always thrilled to have a fellow-Floridian on board. We truly have some unique situations and circumstances in our region and chatting about it with each other seems to ease our efforts. I bought two of my oak-leafs in Tallahassee and one in Dunnellon at a native nursery there. But since then I've seen them for sale at two local nurseries~~ Pine Lake and Duncheon's. I've grown scented geraniums (actually have some in a pot in the back gardens now)and they do okay as long as I give them enough sunlight. No geranium seems to like our humid summers and will stop blooming but the foliage usually remains until it gets cool enough for them to bloom again. I wish had some more definitive answers for you. The hydrangeas are in a shady area that gets shifting sunlight any given time of the day. Maybe that's what saves them from too much heat. They like organic soil with lots of amendments. I've read conflicting information regarding their needs on the Internet so I am just trying out my own methods and 'hoping' for good results. But like I said ... even if they never bloom the foliage is a show-stopper for me. I wish you the best with your cottage garden. Sounds wonderful. Hope you enjoy your caladiums. Easy-peasy color for summer.